Baby #1, sitting with no way to get back up if she fell. Without a second thought, I used to prop my first baby up, and by about 5 1/2 months old, she was sitting well. She would sit there and happily play with her toys. I would build a circle of cushions around her, in case she toppled over (which she often did). I was proud that she could sit so early and used to compare her with other babies who were ‘late sitters’. While she was happy to sit and play, she didn’t crawl until she was about 9 months old and if I recall correctly, she couldn’t push herself into a seated position until about 9 1/2 months. You see, tummy time and independent play virtually stopped when she was able to sit, because she seemed so content to view the world from a new perspective. But, she could ONLY sit if I placed her in that position… and she could ONLY play with the toys I placed in front of her. It was my second daughter, Goldie, who really taught me about the natural progression of gross motor skills in babies. She absolutely would not let me prop her up. If I tried to, she would slump over and slither onto her belly, where she felt confident and safe. At 7 months, she learned to crawl and to sit at the same time, but only because it was then that she had learned the skill to do so. My friend from Germany was visiting when Goldie was going through that developmental phase and I mentioned to her that I thought Goldie was a ‘late sitter’. She then told me about the natural development of gross motor skills in babies and why sitting before crawling (or creeping) is actually sort of backwards. 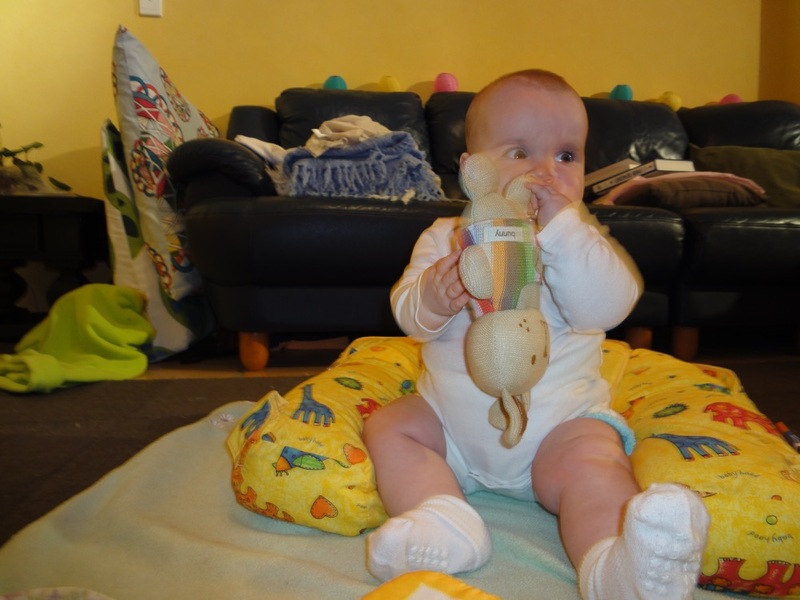 Babies should be able to push themselves up to sitting before they can truly sit. My son is 7 months old at the time of writing this and no way can I prop him up. If I try to, his breathing gets all funny and he slumps over on purpose to get to safety (the floor). He started proficiently commando crawling at six months, and he can pretty much get to anywhere he wants. He stays busy for a long time creeping around the room and hardly needs any help from anyone. But, he still does not sit. My son, exploring freely, at the same age, without needing much help. What Does it Mean in the Long Run? I’ve only read what others have said and I’ve observed my own children and their gross motor development. Please note, I am not an expert on infant development, and we all know how very different every child is! My older daughter is now 7 and the younger one is almost 5. Do I notice a difference in their gross motor skills now? Not really. But, I do notice a difference in the way they acquire new skills and in the way they play. 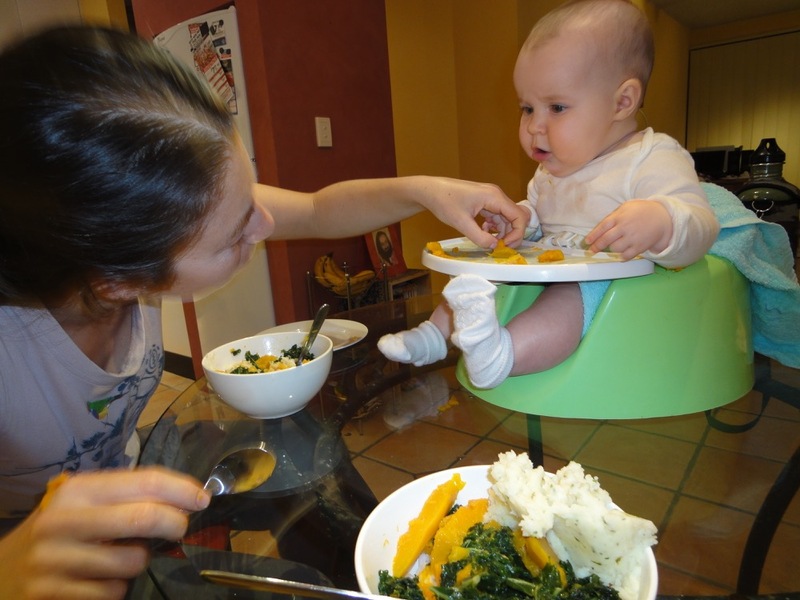 In general, pushing babies to sit before they’re ready is probably just one thing of many that parents get their children to do before the child is developmentally ready. 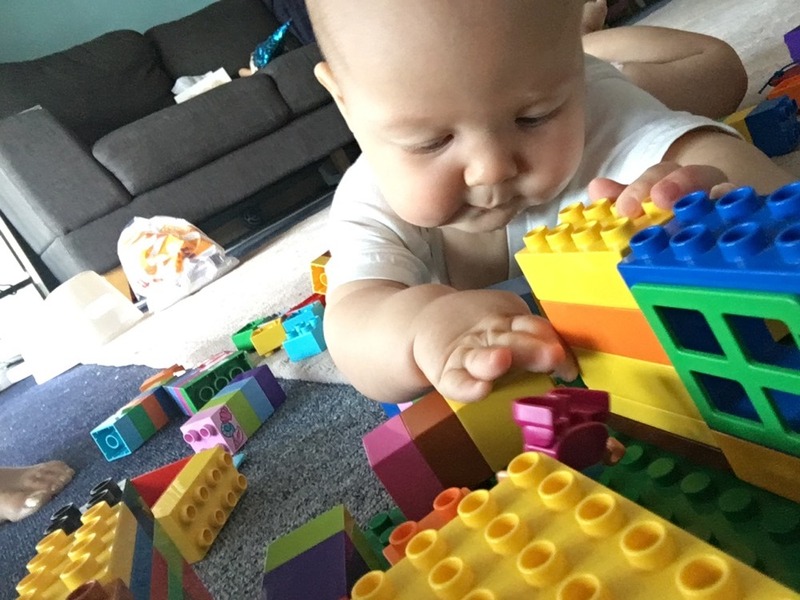 I’ve pushed my older daughter to do lots of things before she was developmentally ready! Getting her to sit early was just the beginning. Confidence is another reason not to sit a baby up. If a baby falls, she can’t put herself back in that position. She gets upset and then you rush to come help her… you prop her back up and then she learns that maybe she can’t do it herself… I see this tendency a lot with my older daughter still! Although it’s less now that I don’t push her to do other things before she’s developmentally ready. Interestingly, my older daughter is always trying to get her baby brother to sit! Even though I never say that he needs to. It must be something stored in her consciousness from when she was a baby. The middle daughter, the one who learned to sit on her own, never tries to get him to sit. Young babies are developing what’s called their vestibular system. That system is a sensory system that has to do with balance, equilibrium, coordination, hand eye coordination, muscle tone, etc. Many people would say that by sitting a baby up, you’re interfering with the natural development of a baby’s vestibular system. Sitting babies in ‘baby seats’, like bumbos and walkers seems to make life easier, but it’s best to let babies roll around on the floor. I used a bumbo seat a few times when my daughter was about 5 or 6 months old (pictured below) and I imagined how it would feel if I had been sitting in it myself and I realized it would have been very uncomfortable, the way you have to hold your neck and head up without having a strong core yet. And, the way her legs were sticking straight out, instead of folded in a sort of ‘seat’ underneath of her. I do use a bouncer now, sometimes, as it’s not always possible to let my son roll around. But as soon as my son started enjoying being on his tummy, I set him down on the floor much more than in the bouncer. Of course, there are times when he ‘sits’, usually in my lap, occasionally in the high chair, but I can tell that he doesn’t really like the high chair, because he starts to slump over. 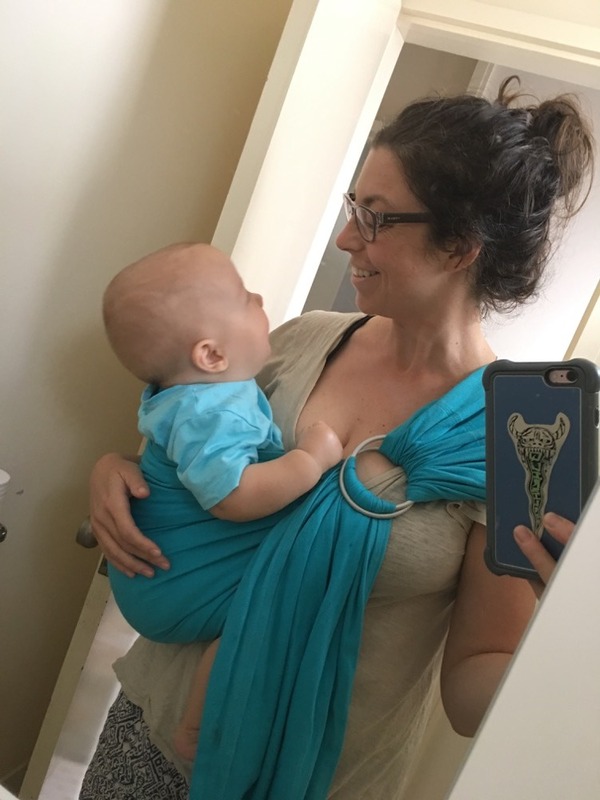 A little sidetracked, but totally related is babywearing and carrying your baby. Carrying your baby around has so many benefits, but a big one is that carrying your baby helps to strengthen a baby’s upper body muscles. When you walk around carrying a baby, it’s a vestibular motion that your baby experiences and he really has to hang on and learn to use his muscles. My mother told me that she used to manhandle us when we were newborns and sling us over her shoulder to get stuff done. And, we got strong really fast because of it! I was trying to get a shot of how much of a big hot mess I looked like… but we sort of look cute. So anyway, it’s not really the end of the world, but it’s something very interesting that many people don’t know about, or never question. Could it be that some babies prefer to sit before they crawl? Yes, probably. But, I think it’s good to know about the natural progression of a baby’s gross motor skills. I never questioned if I should prop a baby up, but when I heard about the reasons for not doing it, it instantly made sense to me! Posted in Baby and tagged natural gross motor development skills, never sit a baby up, should you sit a baby up, sit or crawl first. Bookmark the permalink. I thought this was great! As a pediatric OT I have tried to convince parents that propping up a baby isn’t giving them the experiences that really count. Your observations about how your children approach movement as they get older is unique, and I think very wise. Children notice what we value, what we encourage and discourage from a very early age. Thanks for writing this! Oh, thanks for your professional opinion! It’s amazing what our babies tell us if we really listen. I just found your blog and love it! I’m a new mom with a 3 month old that I thought was high needs, but after learning about Aware Parenting and other philosophies, I think she’s just been overtired due to pent up stress. I really enjoyed this post because it reinforced other things I’ve been reading about letting children develop at their own pace. In addition to not rushing a child to sit up by propping her, I also read you shouldn’t walk an infant around on your feet while holding her hands because it throws off her inner equilibrium growth by balancing for her. Thanks for sharing your experiences online. I look forward to going through the archives and reading more!